On Saturday, Oct. 1, the City of San Marcos will welcome its first signature 10K event—the Double Peak Challenge. Featuring a 10K timed race, a 2K untimed event and a free kids trail trot starting from San Elijo Hills Park, 1105 Elfin Forest Road, all participants must register online at www.doublepeakchallenge.com or in-person on race day at 6:30 am. Off-road racers participating in the 10K Double Peak Challenge will set out at 7:30 am to begin a nearly 2,000-foot elevation gain up to Double Peak’s summit while winding along rugged hillside trails with sweeping views of North County, San Diego. While the 10K race will be a tough timed event that will challenge even the most experienced runners, Double Peak Challenge will also offer a shorter 2K untimed course at 8 am and a free kids trail trot at 9:30 am. All registered 10K and 2K participants will receive a custom commemorative Double Peak Challenge completion medal and awards will be given to the top 10K race finishers in each age category. 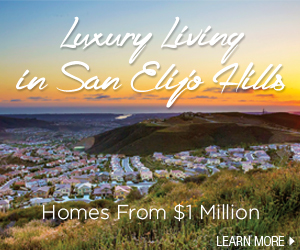 An event expo and beer garden will be located in the lower softball fields at San Elijo Hills Park. 10K race participants over 21 years of age with proof of ID will receive a complimentary beer in the beer garden. Additional beverages can be purchased for $5 each. Other event sponsors include the City of San Marcos, San Marcos Unified School District, San Elijo Hills, Lusardi Construction Company, Rancho Tesoro, Stone Brewing Company, and Lounsbery, Ferguson, Altona and Peak, LLP.